1> open a page in VE, add a Basic citation. 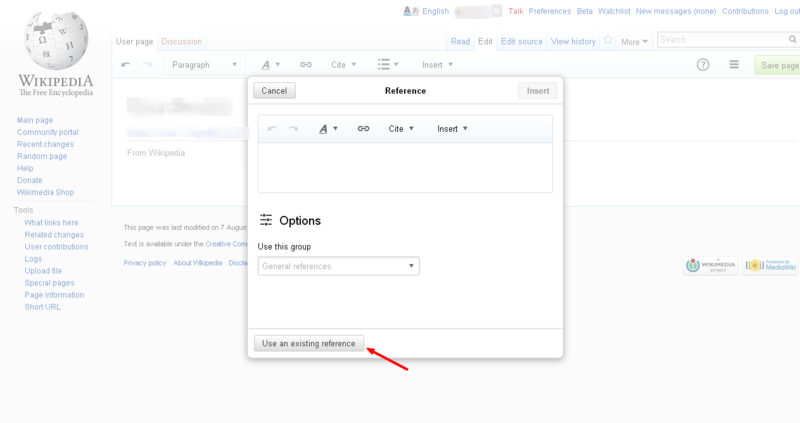 2>Click to add Basic citation again ,in the modal click on “Use an Existing Reference “.Select the citation that you just added. 3>In the editor pane, delete all the citations. 4> Select to add Basic citation again. In the modal notice the “Use an Existing Reference “ button is still active, although there are no citations to add to. Click on it and it opens a blank Reference modal. bzimport set Reference to bz70611. The Re-Use option in the Cite menu from the toolbar still remains enabled when there is no reference in the article. This bug is about a very specific way to break the existing disabling of a different button. What you propose makes sense but it's not in scope here. I'll take a look into doing it anyway, but I'm going to re-close this bug.